The days are getting shorter and the nights colder. As we quickly approach our average first frost date I realize that it’s time to pull out our sweet potatoes. Because of late rains all over the U.S. we didn’t receive our slips until late June, giving them a rather short season. As usual, most of the garden had been planted leaving very little space for the sweet potatoes. Sweet potatoes do best with low nitrogen, otherwise they put out too much green growth and not enough energy goes into growing nice, large tubers. I ended up choosing to put them in our potato bed, which hadn’t been amended for quite some time, so I knew the nitrogen wouldn’t be high. The toughest part of growing sweet potatoes was finding the slips. Sweet potatoes are propagated vegetatively by sprouting the tubers and carefully cutting off the sprouts. These sprouts with a small amount of roots are called slips. You can learn more on how to propagate your own here. Most slips are grown in the southern states and are strictly prohibited from entering into California because of the risk of leaf curl disease, which could have a huge impact on California’s sweet potato production. However, I was incredibly lucky to not only find a place that could ship sweet potato slips, but also sold rare heirloom varieties. Sand Hill Preservation Center, located in Calamus, Iowa, has permission to ship slips to California because they grow all their own rather than having them drop shipped from the southern states. Iowa doesn’t have a problem with leaf curl disease so it’s one of the only online retailers that I can order slips from. The downside, however, is that I get the slips later in the year. This year we grew three heirloom varieties. Since this is the first year growing heirlooms we’ll be looking for what does best here. Frazier White is a white skinned and white fleshed heirloom.. Purple has deep purple skin and purple flesh. Oakleaf has these beautiful deeply lobed leaves that resemble oak leaves. They have pink skin and light orange flesh. Harvesting sweet potatoes is easier than potatoes. All of the tubers are found directly under and attached to the main plant. Use a spading fork to help pry them up. I found this was better than a shovel because you’re less likely to sever the roots. After pulling them up and detaching them from the plant I brush off the dirt and laid them out on a burlap sack in the sun for a few hours to cure. Then I moved them to the garage to cure for the next week. Curing allows them to store longer as well as increase in flavor and sweetness. The Frazier White had a pretty mediocre harvest. The tubers were small and there weren’t very many of them. The flavor isn’t that great either. Most likely won’t be growing these again. The Oakleaf had even a worse harvest. It’s a bush type rather than a vining type so it wasn’t expected to have a smaller harvest, but I didn’t expect that small of one. The flavor is markedly better than the Frazier White though. I’m not sure if the reason the harvest was so small because of the variety or because of where we planted it. It wasn’t in the potato bed, but rather the zucchini and tomatoes where it got shaded out. The Purple, however, outshined both varieties. 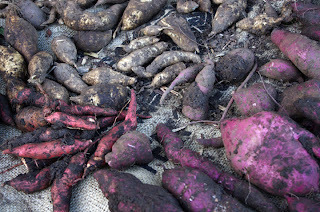 The tubers are huge and the harvest was large. The flavor is similar to the Oakleaf, but I’m sure they will sweeten up in storage. I think this will be the one we stick with. 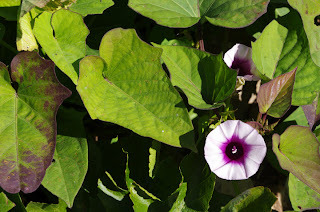 I was able to grow purple sweet potatoes too and my family loved them – especially in pies. I really appreciate your post!